Half of Scots who graduated from university and some college courses in the past five years are working in "non-graduate" jobs, according to the Office for National Statistics. A survey by the ONS suggested 52% are in jobs which do not require further or higher education qualifications. These include those with qualifications like HNDs and HNCs and higher levels of SVQs through to degree-level and up. 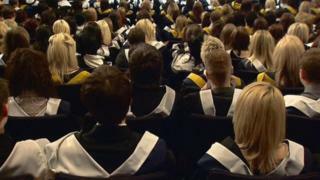 But university leaders say the ONS definition of graduate is too broad. They cite different studies showing that up to 72% of full-time first degree leavers were in posts classified as professional employment six months after graduating from university. BBC Scotland is examining the lives of Generation Y, the "millennials" born between 1980 and 2000. There has been a steady increase in the number of people in this age bracket going into further education, with the number of students in Scotland on the rise. However, it has been suggested that many might not ultimately go into careers related to their studies - or even those considered graduate professions. The Office for National Statistics gathered information on graduate destinations as part of its annual population survey. It found that 51.8% of recent graduates - defined as those leaving full-time education within five years of the survey date with a level of higher education above A-level equivalent standard - were in a job which did not require this level of training. The figure for the UK was a whole was 46.4%. The data also suggest that many of this group may not go on to graduate-level jobs in future, with only about 40% of non-recent graduates - those who graduated more than five years ago - being in graduate jobs in 2016. The ONS defines non-graduate jobs as those which do not normally require the knowledge and skills devolved through higher education, listing examples including receptionists, sales assistants, many types of factory workers, care workers and home carers. They cite a report from the University of Warwick which notes concerns about the "growing mismatch between skills and the knowledge developed on degree programmes and the requirements of employers". However their definitions were challenged by Universities Scotland, who said the ONS figures "define a graduate far more broadly than usual", due to the inclusion of various HND and HNC level courses. Oliver Newton, policy and research director at the Edge Foundation, said there was "a challenge on both sides of the equation". He said: "On the one hand we're bringing out more graduates than we need in some areas, and on the other some of those graduates don't necessarily have the skills and work experience that employers are looking for. "The UK has one of the highest rates of graduate underemployment, people who have got a degree but aren't necessarily using it for a job that requires one." Cat Taylor studied history at undergraduate level, and then did a postgraduate degree in 18th century cultures. She said she didn't think of having any other options when leaving school but said she realised she was "not very employable" at the end of the academic process. The 29-year-old now works front-of-house in a museum, something she "never" thought she would be doing while she was studying. She said: "I'm glad I did my degree, because I loved it. But if I could look back in time I don't think I would make the same choices again. "The whole thing makes me feel kind of like I wasted a lot of time. I don't really think I did, because I do love what I did, I love learning - but I didn't need to do any of it to be where I am now. "I never thought that this would be what I'm doing, but admittedly I'm not entirely certain what I thought I was going to; I thought I would do my degree and then that would open up opportunities to me. I don't think that happened. "I would tell 16-year-old me that 'you're going to have to go to university because you don't have any clue about what else you could do. But study IT, study something which is useful, study nursing'." Others who didn't go to university have highlighted how other paths can work out. One 27-year-old woman became an overhead lines apprentice for Scottish and Southern Energy after applying for the role after seeing it advertised online. She said: "I was speaking to a lot of friends and family, a lot of whom had their own trades - very few of my family had went to university. "I saw them with good career prospects and good money coming in, so I thought, why not? Why go to university when I could be earning money doing this? "I chose an apprenticeship because I love being outside and I love hands-on learning. The idea of getting a good qualification as well as earning a wage really appealed to me. You're guaranteed a job at the end of this. "I think the best idea would be to really think it through, speak to as many people as possible, your family and friends. Do your research about where you could go, what sort of jobs you might like, and above all pick something you're passionate about and that excites you." On the BBC's Good Morning Scotland programme, Robert Wright, a professor of economics at Strathclyde University, said many graduates enjoy much better prospects than those who do not go in to further education - but added that some do find themselves "underemployed". He said: "If we look at the data, even through the recession graduates of higher education institutions do much better on average than non-graduates in terms of employment and earnings. We can say with some confidence that they still have much better prospects than those without that education. "But that's a general statement, on average. There are certainly graduates who do not do so well, find themselves underemployed in jobs which do not require their skills, and they remain in these jobs for long periods of time. "To me it's clearly the case that underemployment is an indicator that what's being supplied by the higher education sector is not clearly a match for what's being demanded. "There is this mismatch. But then again we have to think about what the role of further and higher education is; is it only to get people into the job market for work? Some people say that should be the main priority and I don't disagree with that. "But the other issue that is important here is whether or not the taxpayers should be paying for underemployment, Should there be free tuition fees for people who end up with a university degree, working in non-graduate jobs?" Luke Humberstone, president of the National Union of Students, said students can pick up skills at university which can transfer into other areas, without necessarily staying in the professions they studied for. He said: "We've got to consider what's best for the individual. Yes, some students may want to use their skills that they gained at university, but some others might simply be able to get a job that suits them. "It's not just about getting graduate employment, it might be that they start their own businesses and contribute to society that way. Education in our society is a public good, and I think that increasingly society believes that." Universities Scotland said the ONS had taken an unusual approach to how graduates are defined, pointing instead to figures from the Higher Education Statistics Agency which show a "very different" picture. Director Alastair Sim said the figures "define a graduate far more broadly than usual as they include anyone holding a qualification above A-level. The picture is very different for university graduates. "72% of graduates with first degrees, who go into the labour market, are working in professional occupations within just six months. By then, the average university graduate is earning £22,500. The percentage of graduates working in graduate-level careers continues to grow in the years that follow and three and a half years after university almost 9 of every 10 are happy with their careers to date. "Universities work really hard to support graduate employability. This is reflected in very positive employability figures and high employer satisfaction. We also value the minority of graduates who choose to continue their studies or combine more study with part-time employment." Scottish government education minister Jamie Hepburn pointed to statistics which showed very low unemployment among young people, and also highlighted the HESA figures. He said: "I do recognise there is an issue with underemployment, but I'd urge people to look at the evidence before us. "What [HESA] found here in Scotland was some three and a half years after graduation, graduates from Scottish universities will earn on average £500 more a year than their English graduate counterparts and £2,500 more a year than those who've gone to Welsh and Northern Irish universities. That seems to me to be a positive outcome. "I do recognise that underemployment is a genuine issue. I'm not suggesting that everything is absolutely correct here in Scotland, and that's why for example we're taking forward the developing young workforce agenda, which is now in place across the entirety of Scotland, bringing employers and the educational environment closer together to make sure people coming out of their school experience are better equipped for the world of work." Colleges Scotland said students graduated with "work-ready skills", and said they worked closely with schools, universities and employers to "support the economic and social needs of their regions". Chief Executive Shona Struthers said: "Colleges are increasingly becoming the route of choice for young people progressing on to university, with the Scottish government's agenda on widening access to higher education increasingly being delivered by colleges supporting over 90% of the growth in entry to university by disadvantaged students since 2006. "Scotland's colleges remain committed to further development of relationships with employers, to ensure closer alignment to make the best use of talented graduates who are keen to gain meaningful employment and contribute to society, and meet the needs of the labour market." BBC Scotland is discussing the issues facing Generation Y all of this week, and will be hosting a live Facebook debate featuring young people, government ministers and experts on Friday. Send in your questions on social media using #BBCGenY or to newsonlinescotland@bbc.co.uk. Meet the millennials: Who are Generation Y?